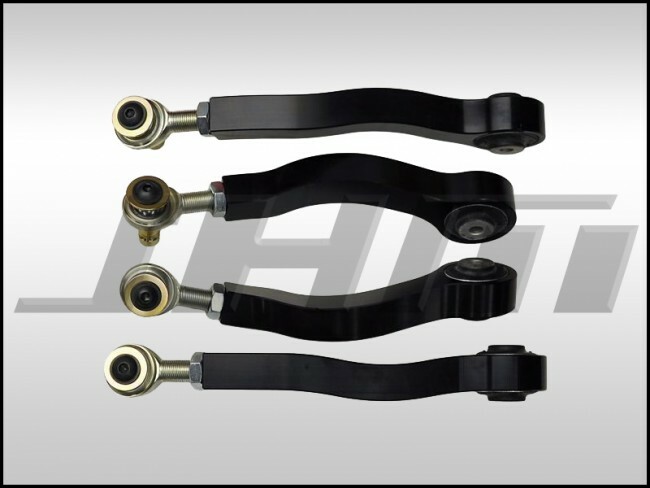 Introducing fully adjustable upper control arms for the B8 Audi A4-S4 and A5-S5-RS5!!! Track Spec: This setup is for those who have lowered their car from OEM ride height and are looking to have even more negative camber for better track performance. These arms are 1/8" shorter than stock and offer an additional 5/8" of inward adjustability from stock length and are adjustable in 1/36" increments. Each 1/36" adjustment is approximately .1 degrees of camber for highly accurate adjustments. - Adjustments can be easily made by threading out an M6 head allen bolt, the pinch pin stays installed in the upright. A jam nut keeps everything tight once adjusted. - Dust boots are now included with all adjustable upper control arms. We ship the boots uninstalled; once you have the alignment set, install the dust boots before final installation. 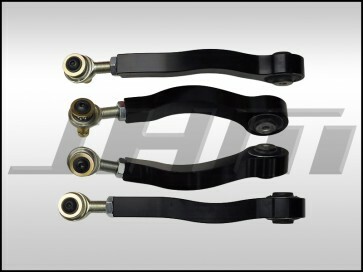 - Control Arms are completely rebuildable. Go back one section and select them or put the following in the search box: " Rebuild Kit for 034Motorsport Density Line Adjustable Upper Control Arms". - Arms ship with everything pictured and assembled. Price for one kit for one front suspension. NOTE FOR INSTALLATION: Do not run the heim joints with less than 8 threads engaged in the control arm itself. Running less threads than this can cause failure of the part. Neither 034Motorsport nor JH Motorsports will be responsible for failure due to installation errors. If your alignment requires that you must have less than 8 threads engaged contact us before proceeding. UNDER NO CIRCUMSTANCE should you run the car with less than 8 threads engaged! For the M10 pan head allen bolt, torque to 45 ft/lbs and secure with blue loctite. See the video below depicting the ease of adjustment when using these control arms. The arms DO NOT have to be removed to adjust camber!!! Dust Boot Installation: DUST BOOT INSTALL INSTRUCTIONS HERE.